One of the most common accessories in the pinup/vintage world and one that is super beginner friendly, affordable, and fun. Naturally, we’re talking about hair flowers here. A while ago, I did some very quick and simple hairstyles that work well with a vintage theme and I thought it worth continuing on that theme. These are all new or different variations of styles you’ve probably seen before, but they shouldn’t be repeats of the same kind of flower with the same kind of style. Once again, these are made in quick succession at my desk and I use minimal tools when styling, for the sake of simplicity. Naturally, if you intend to wear one of these styles to an eve nt, you might want to style them more carefully, add more bobby pins, and use hair spray to secure them. You can do these both on straight and curled hair, the styles vary in how friendly they are towards different hair lengths but it’s worth giving it a try. 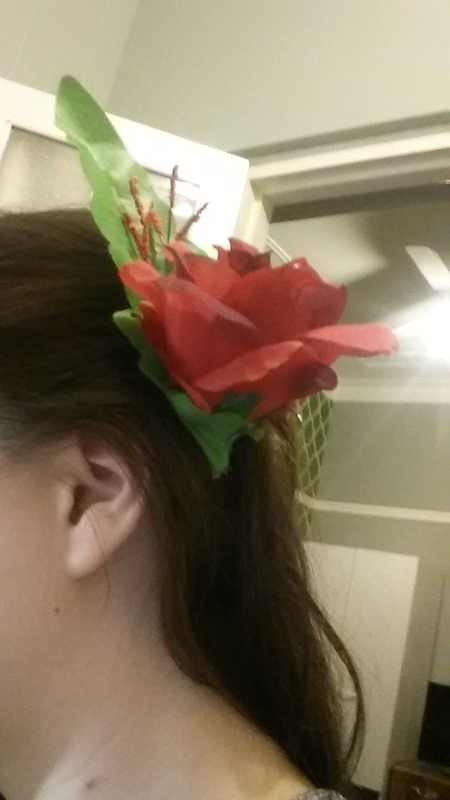 Here is a very simple way of wearing a hair flower. Comb your hair over one shoulder and use the flower to pin your hair back and up. As you can see on the left picture, I did this in a fairly sloppy way. You want to ensure that all hair is actually behind your ear if you intend to wear this style out. This works well with longer flowers so to speak as the more compact typical roses tend to really just stand out like a bun on your head. This is a simple loose braid pulled over one shoulder with a small delicate hair flower attached to the opposing side. Sorry about the blurry image, but it’s surprisingly difficult to take a lot of good pictures when you’re tired. This is a good way to use smaller hair flowers as just a detail and not a main feature of your style that day. Another option is to attach a hair flower to the hair tie itself, both to cover the tie but also to make it look like a more realistic way to wear a real flower since they don’t tend to come with attached clips. This is a great option if you feel like large hair flowers would be overpowering or if you just want something more discrete/elegant as opposed to a full statement flower. Remember from the quick and easy hairstyles post when I showed how to do a pony tail and twist it down on itself? Loose pony tail, behind the hair tie you separate the hair to create a noose, you lift the tail up and then down through the noose. Then you secure it all in place. When you’ve done that, you have a great chance to wear more elaborate hair flowers without looking like you’re wearing a crown of some sort. The piece I’m wearing is three roses on a flat surface with a clip on the underside. I attached it to the back of my head rather than just above the pony tail to allow for the hair style to still be fully visible and frame the flower piece. This is a very similar style but done quite differently. Instead of even doing a pony tail, I’ve just pinned my hair back with bobby pins. I took a section of hair from each side and pinned them back in the middle of the back of my head, a classic I Need This Hair Out Of The Way style. What I’ve done here is I have a flower with added leaves on it that make it clear that it needs to be flat against your head, centralised, and given enough space. Unlike with the flower above, this flower doesn’t need any framing due to the lighter leaves around it that create a natural frame. If you use a big piece like the one above but don’t frame it in someway, it tends to look more like a growth than a part of your actual hairstyle.